GAZA, OCCUPIED PALESTINE — Mint Press News‘ “Behind the Headline” series hosted by Mnar Muhawesh conducted an exclusive interview with Kevin Neish, survivor of the latest Freedom Flotilla aid ship. The Floatilla was headed to the besieged Gaza Strip when it was attacked and hijacked by Israeli soldiers in international waters. Israeli soldiers of conscience anonymously blew the whistle on how they received order after order to deliberately target civilians without cause, challenging the mainstream media’s “human shields” myth. Israel had leveled entire towns and villages within Gaza. After all the bloodshed and destruction, Israel admitted that no one from Hamaswere responsible for the 3 kidnapped Israeli teens after all. Netanyahu purposefully withheld the information from the grieving victims’ parentsso that his government could mass murder Palestinians. With estimates of rebuilding Gaza to its prior state being as high as 100 years, activists have taken it upon themselves to bring aid to Gaza since Israel’s blockade keeps out essential items for medicine, shelter, infrastructure, and food. A total of three Freedom Floatillas have set sail in attempts to break the blockade. Israel’s wanton, unprovoked and inhuman violence was exposed to the world. On the first voyage, 10 unarmed international aid workers did not return home as they were brutally murdered by IDF soldiers, some execution style. Kevin Neish was on the 1st and 3rd Floatillas and helped to photograph the violence and many of the bodies of dead activists who just wanted to make life better for those who experience this type of violence on a daily basis for the past 60 years of the Israeli occupation. In initial reports of the capture of the most recent Floatilla, the IDF lied and said they boarded the ship non-violently in an attempt to appear as if their behavior of non-violently breaking international law is a step up from murdering unarmed activists. Neish and other activists tell a different story of a hostile takeover of the ship, tasering, and illegal detention. This takeover occurred in international waters, proving Israel’s disregard for international law. 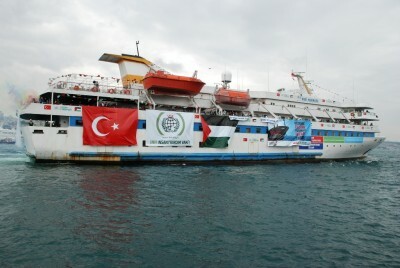 Neish mentioned that the boat used for the Freedom Floatilla was of Swedish national origin, where the government recognized the state of Palestine. The ship did intend to legally enter the state of Palestine, instead of illegally entering Israel as the IDF claims. Also, Neish noted that Israel attacking the ship is tantamount to an act of war against Swedish soil. The ICC dismissed the original case of the 10 murders on the first Floatilla, even though they admitted it was a war crime. The current appeal now has a much larger base of evidence including the legal equivalent of invading Swedish soil. If the ICC rejects it again, it will certainly bring up questions about the legitimacy & neutrality of the ICC, as if Israel’s blatant war crimes against Gaza aren’t sufficient grounds for international war crimes prosecution at The Hague. Mint Press News is an independent watchdog journalism organization that provides issue-based original reporting, in-depth investigations, and thoughtful analysis of the most pressing topics facing our nation. We focus our coverage on issues relating to the effects of special interest groups, big business and lobbying efforts and how they shape policies at home and abroad, including American foreign policy. Through the lens of social justice and human rights, we report on how these dynamics drive our foreign affairs and impact the world, and examine the effects they have on our democracy and freedoms as defined by the constitution.